Happy weekend to you all, and to those of you who are celebrating Christmas and Hanukkah, I wish you a wonderful holiday! I spent last night and this morning with my mother and Steven, and I’ll be gathering with a small group of family friends later today. I haven’t done much cooking–I’m still climbing back from some post-cookbook burnout–but I do have my lentil and sweet potato loaf ready for sharing. I’ve had mixed feelings about the holiday season this year, for reasons that are complicated. I’ve written about some of those feelings here on the blog, including my own struggle to balance holiday socializing with introverted tendencies, as well as the pressure that I think many of us feel to greet the holidays a certain way, to summon up very particular feelings about them. Yesterday morning, as I drafted part of this post, I got to thinking about the deeper dimensions of my holiday ambivalence. Part of it, I think, is that I’ve been struggling to create meaningful holiday traditions for myself as an adult, so to speak, as a grown-up person who has quite a bit of choice. I have a tiny little family–it’s just me and my mom, really. In some ways this is a blessing: it affords me great freedom, and it has also encouraged me create family through friendship, partnership, and so on. It’s not always easy, though, and this is especially true during the holidays, when most people tend to celebrate within their biological families. There is a sense of rootedness that I sometimes lack, a feeling of belonging to something that is bigger than me. The feeling has crept up on me especially in the last couple of years, in part because most of my friends are now building nuclear families of their own. I watch them settle into marriage and parenthood, and while I can’t necessarily imagine those things for myself, at least not right now, I envy my friends’ sense of purpose and kinship. Oddly enough, I put these thoughts on paper nearly a day ago, and today my perspective is quite different. I still acknowledge these feelings, but in the last 24 hours I’ve been poignantly reminded that tradition and belonging take many different forms. My holiday traditions are small, but they’re no less meaningful for being intimate. I’m not part of a big clan with longstanding rituals, but I’ve got small customs of my own: stirring a batch of steel-cut oats every Christmas morning. Christmas eve dinner with my mom (and lately, my mom and Steven). 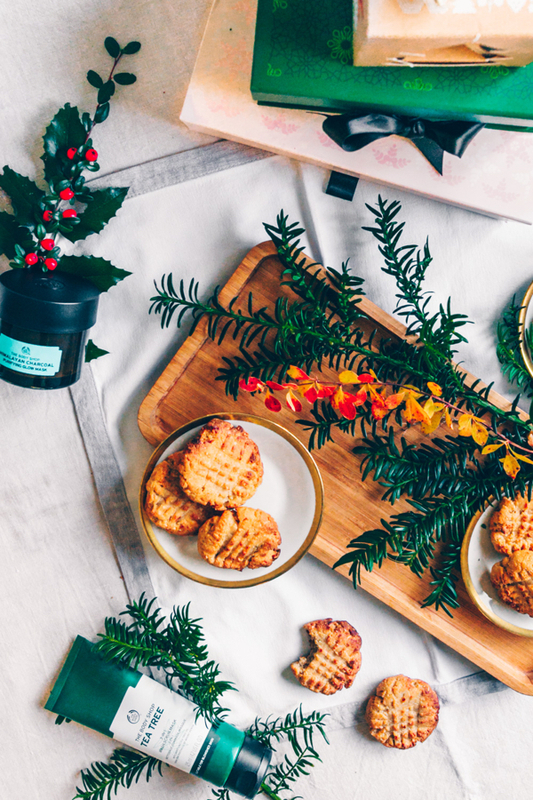 Burning pine-scented candles, watching classic movies, baking shortbread, wrapping gifts. This, really, is the stuff that holidays are made of, and in the end, it isn’t scale that matters. It’s the power of observance, the meaning that resides in repeating the same festive gestures year in and year out. No matter what changes in our lives, no matter how we’re feeling or what’s going on, there are certain motions we go through at this time of year, and if we’re lucky, they bring us home. Perhaps I’ve been looking for roots and rootedness in the wrong places. As is so often the case, I think I need to become more finely attuned to the microscopic. So much beauty, joy, and comfort reside in the little things, the sights and smells and actions that we take for granted precisely because they’re a steady part of our lives. Today, on this Christmas of 2016, I’m more committed than ever to not taking them for granted. Indeed, I am so deeply grateful for each and every one of them. Whatever your holiday observances are, be they big or small, shared or personal, I wish you peace and happiness as you partake in them, today and always. And now I’m transitioning over to one of my favorite observances, which is weekend reading. In honor of Christmas, I’m sharing five holiday cookie recipes today (I couldn’t resist), along with the usual roundup of articles. Let the vegan Christmas cookie parade begin! First, I love Katharina’s simple, stress-free vegan peanut butter cookies. These are easy enough to make at the last minute, and they happen to be gluten-free, too. 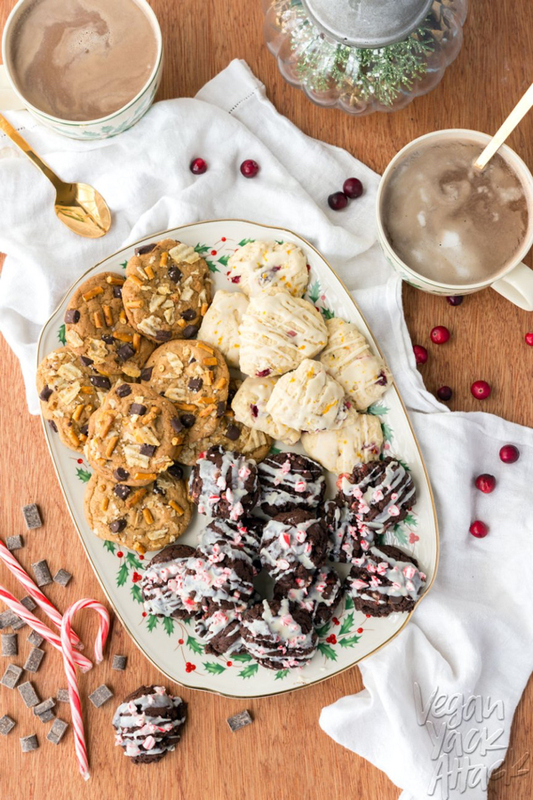 In true holiday spirit, Jackie has whipped up some double chocolate peppermint cookies that are drizzled with white chocolate and candy cane pieces. Festive, playful, and fun. Jessie’s awesome Christmas cookie post features not one, but three creations, each of which are calling my name. But I’m particularly intrigued by her peanut praline cookies–yum! I’ve seen tons of recipes for Boston cream pie cupcakes or cakes, but I have yet to see a cookie version. 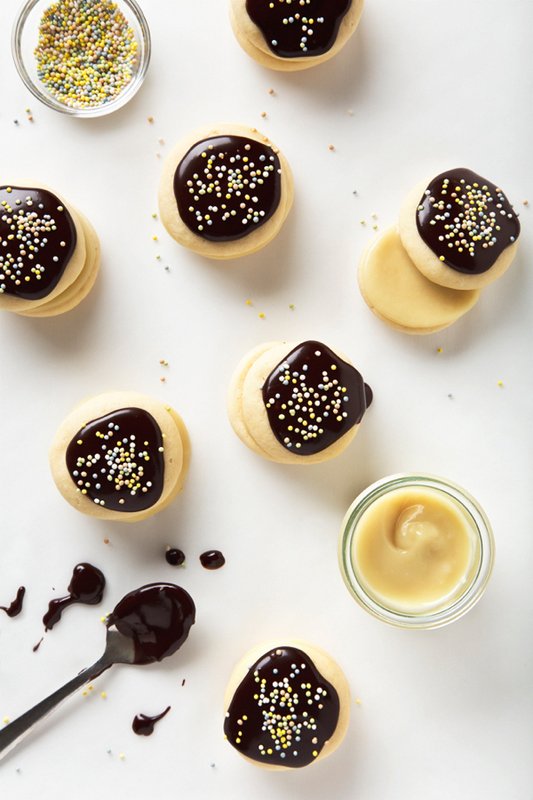 Leave it to Amanda, whose vegan Boston cream pie cookies look just awesome (and like all of her recipes, they’re simple to make). 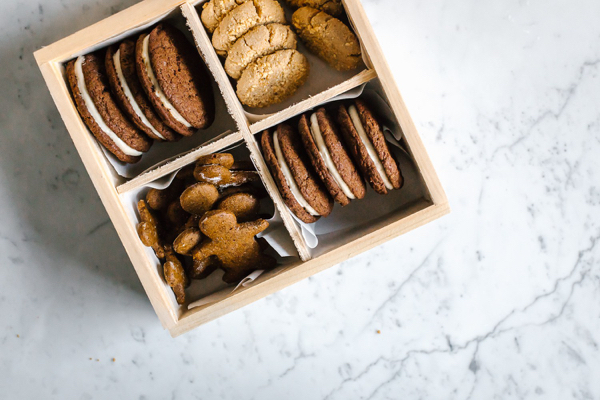 Finally, what would Christmas be without a great gingerbread cookie? 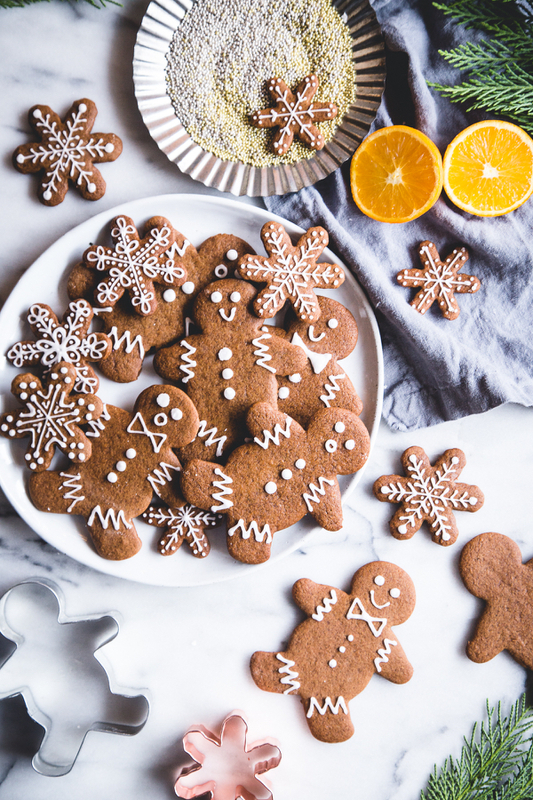 These ingenious vegan gingerbread cookies are infused with citrus, as well as all of the traditional spices. Yum! 1. It’s been about four years since the Healthy, Hunger-Free Kids Act’s improved school nutrition standards went into effect. And we are little by little gathering some evidence on how effective those standards have been. Predictably, there are gains, challenges, and some stalled fronts. Bettina Elias Siegel, who is a smart and passionate champion of school lunch and other childhood nutrition efforts, analyzes where we are and where we need to go. 2. Interesting research on the impact of glucose on the immune system as it fights of systemic inflammation. This research complicates the time-honored advice to “feed a cold, starve a fever,” as well as the assumption (commonly spread around in health/wellness circles) that sugar is always pro-inflammatory. Instead, it gives credence to the idea that different nutrients can behave differently based upon the type of crisis or infection the body is facing; it’s also evidence that sometimes our cravings (for hot tea with sugar during the flu, for example) are wise. The researchers divided people into three groups based on these factors. “Favorable” required at least three of the four factors, “intermediate” required two of them, and “unfavorable” required one or none. Across all studies, those with an unfavorable lifestyle had a risk that was 71 percent to 121 percent higher than those with a favorable lifestyle. In real-world numbers, the risk of a coronary event was reduced by half in a ten-year period. That is a very meaningful shift–and I think it’s a super helpful message to those who are at risk for, living with, or caring for a loved one who suffers from heart disease. 4. Until recently, eating disorders have widely been categorized as one of the most lethal and difficult-to-treat mental illnesses. High rates of relapse are commonly reported and cited as evidence of the diseases’ fundamental intractability. With my patients, I try to emphasize how serious these illnesses are to help mobilize them for treatment,” she says. “Our current data argue both that early symptom change increases the chance for long-term recovery, which can motivate new patients to engage in treatment, and that improvements continue even over the long term, which can encourage patients who have been ill longer to keep working towards recovery. 5. As you’ve probably guessed, I love first-person narratives and reflections from health care givers and workers–especially those that call into question those ways in which medical care sometimes fails to be adequately empathetic or patient-centered. …While the grind of medicine can make new doctors feel the need to operate like a machine, I’m taking a vow now: I’m promising my future patients that I’ll always try to take a few minutes to make myself as a doctor more visible. I hated being in the dark, so I’m going to try my best to bring the families into the light, making them my first priority and not my last. It’s a touching essay, a meaningful reflection on the power of empathy and firsthand experience. On that note, I’m off to experience Christmas. I’ll be back this week with an easy recipe that can double as breakfast or snack fare, as well as a simple skillet meal to help you welcome the new year. Stay tuned. Beautifully written. Merry Christmas dear Gena. It was refreshing for me to read this post because I feel so similarly. I, too, can’t imagine marriage and parenthood for myself right now, but I can never help comparing and wondering. I’m a true introvert and found myself struggling lately with holiday parties and even friends just simply wanting to catch up. I know our situations aren’t exactly the same, but reading your thoughts made me feel less alone. So, thank you. Christmas is really a made up holiday. It isn’t real. Jesus was not born in December. The Christ is available every day and it requires nothing. You are already fully surrounded by the beauty, love, peace, quiet that the day Christmas is intended to celebrate. You are never alone no matter how many or few individuals you are with. And you are always loved and can never be separated from true Divine Love. Thank you for this weekend reading. Happy new year and more blessing to you.